We know that choosing the right catering is key for any event, especially for outdoor events. Outdoor events need catering which they can rely on to adapt if the weather causes issues. At Taste the Cracklin hog roast in Norwich, you can choose catering which is perfect for indoor and outdoor events. 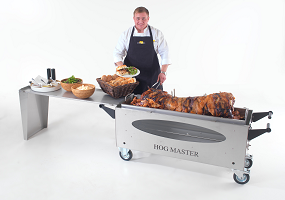 Whether it’s a corporate event, a party or a wedding, there is no limit to the occasions that make a suitable reason to host one of our hog roasts. At Taste the Cracklin we offer a number of different menus giving variety and allowing each organiser to choose their own unique menu to ensure there is something for all of their guests. The only menu we offer which doesn’t have any variation is our simple buffet option which is roasted hog in bread rolls, the perfect quick snack. We also offer a great 3 course menu which allows you to choose two main courses plus a vegetarian option giving you something for all your guests. There are a number of different menus which we have and so you can find the perfect one for you and your event. A hog roast is perfect for any occasion whether it’s a birthday party, corporate event, or a wedding, you can expect the best hog roast Norwich has to offer at all times. At Taste the Cracklin we take pride in providing the very best, succulent, and tasty hog roast for all occasions. To find out how we can help you with your catering needs. Why not get in touch with us today to discuss the various options and allow us to better understand your requirements and how we might best be able to help you. Once we get to know what you require, we can then talk you through the various options that best fit your requirements. Hopefully we’ll speak to you soon.